100% Natural soy wax blended with premium essential oils. Enjoy up to 50 continuous burn hours or approximately 75 hours of 2 to 3 hour burn increments. When lighting your candle for the first time, be sure to lean your candle to the side where you can comfortably place the flame in the corner of the wick "Where the wood meets the wax." Allow nearly 10 seconds for the flame to spread from the bottom of the wick to the top corner to ensure an even flame. After the flame has spread from one side of the wick to the other, it is now time to level your candle and begin to enjoy the fragrance. Burn times vary according to ambient temperature,humidity, and increment lengths. Never discontinue your candle burn before achieving a complete liquid burn pool, this method prevents the tunneling effect. After enjoying a 2 to 3 hour burn session and your candle has completely cooled and solidified, the cedar wooden wick will have a burnt portion that should be carefully removed. If you notice an overly large flame upon relighting, this is signs it is time to trim the excess portion of the burnt wick. For best results, simply use your fingers or a wick trimmer to pinch off the burnt portion of the wick. Please ensure no remnants of the burned wick are left on the wax. When finding the proper placement for your candle, be sure it is kept away form drafty areas and ensure it is leveled on a heat-resistant flat surface. It is best to keep the candle out of direct sunlight to avoid discoloration of the soy. Please remember to never move your candles location while it is burning. One of the biggest benefits of soy wax is that it cleans up easily with just soap and water. If you experience a spill of melted wax, simply clean with warm soapy water. Once your candle has completely burned you may recycle or repurpose the container, it makes a great rocks glass! 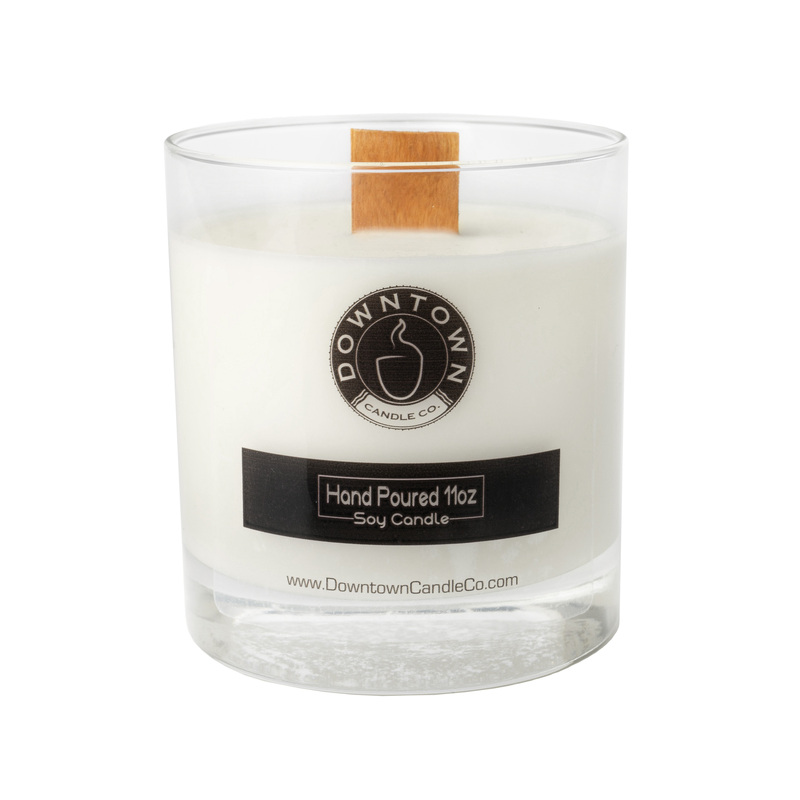 Copyright Downtown Candle Company. All Rights Reserved. Online Shop Creator by 3DCart.